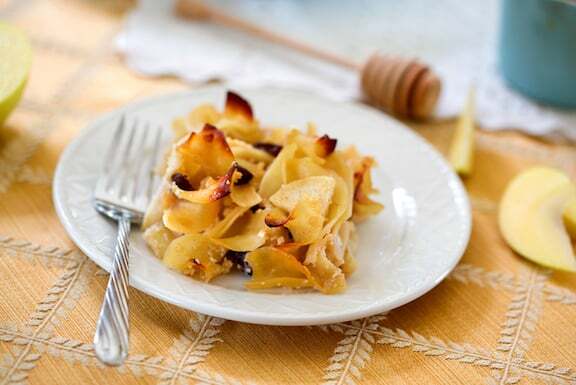 This mildly sweet vegan noodle kugel, made dairy-free, is a classic Jewish comfort food, and always welcome at celebrations such as the Jewish New Year (Rosh Hashanah) and Hanukkah. Adapted from Vegan Holiday Kitchen. Photos by Hannah Kaminsky. This mildly sweet noodle pudding, made dairy-free, is a classic Jewish comfort food, and always welcome at celebrations such as the Jewish New Year (Rosh Hashanah) and Hanukkah. Cook the noodles according to package directions, then drain. Meanwhile, cut the tofu into 3 or 4 slices, then blot well between layers of paper towel or clean tea towel. Transfer to a large mixing bowl and mash until finely crumbled. Stir in the vegan sour cream or cream cheese, and agave nectar. Stir in the cooked noodles and all the remaining ingredients. Transfer the mixture to an oiled, shallow round or rectangular 2-quart casserole dish. Bake for 35 to 40 minutes, or until the top begins to turn golden. Let stand 15 minutes before serving. This is also good served at room temperature. Note: This is traditionally made with egg noodles, but look for other soft ribbon noodles like spelt ribbons, or flat, soft rombi pasta. Here are more of VegKitchen’s recipes for Hannukah. Hi. Have you tried this with silken tofu? All i have is silken and firm. Lena, I’m sure that will work just fine. Enjoy! great! this is my sons favorite food!!! Where do the apples, butter, and raisins come into play? Please help!! Bianca, it’s step 4, when you add the cooked noodles and all the remaining ingredients. Sorry if that was unclear! Would you please identify the packaged vegan noodles you used? Thanks! Pam, sorry — the note promised in the recipe was inadvertently left out. It should say: This is traditionally made with egg noodles, but look for other soft ribbon noodles like quinoa ribbons, or flat, soft rombi pasta. In the photo, rombi pasta is used. I made the correction and it should show up in the post in a few hours. Do you make the quinoa ribbons or did you buy them? I can’t find them online to purchase anywhere. Thanks. Hi Sara — I posted this recipe a while back and it seems like quinoa ribbons are no longer available. So I updated this to spelt ribbons, for example: http://amzn.to/2gtdoOa — and rombi pastas is good too. If all else fails, spiral pasta like rotini would be good too. Rice noodles would work, too. 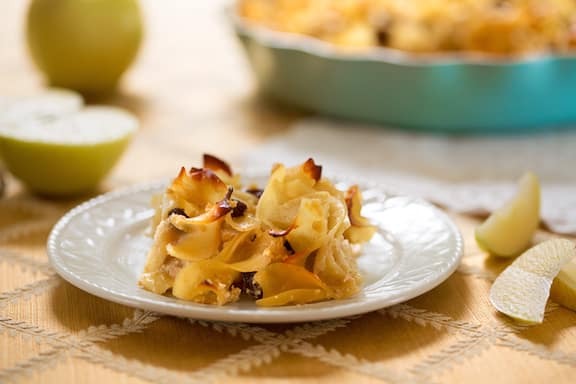 In the years after my mother died (46 years ago) we got repeated phone calls from friends and family asking if she ever wrote down her recipe for egg-based noodle kugel (she did not.) 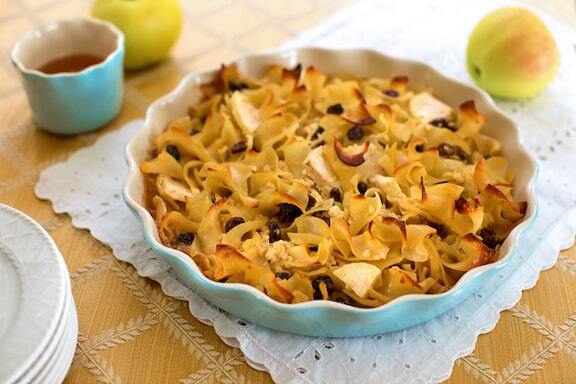 Until now, I have not found a recipe that tastes as good as my mom’s noodle kugel. Thank you so much! What a lovely comment Gail, and such a nice tribute to your mom. I’m glad this recipe brought back fond memories! Everyone has always loved my kugle and since becoming vegan a year ago I’ve been left out of my own kugle! Until now! This is just as good as mine! I just add the brown sugar, bread crumb, cinnamon, and earth balance mixture sprinkled on top (like my original) and people love it. A million thanks for posting this! How great, thanks for your kind comment, Timi! Tried to press 5 stars but only 2 went through! Made this for the holiday weekend. It was a success with everyone vegans and non-vegans. I also added dried cranberries, toasted almond slices, and substituted agave or maple syrup for honey. Also used whole wheat penne pasta and firm tofu. All worked well and was delicious. Will probably make this again. Looks like a wonderful recipe and I’d love to try it. Have any thoughts on a savory version? Do you think it would be good with sauteed onions, and with scallions sprinkled on top? Of course leaving out the vanilla, cinnamon, maple syrup and raisins? Thanks for all the great recipes. Hi Julie — I’ve never given any thought to a savory version of this, but sure, that sounds great — I might try it myself! If you think of it, come back and let me know how it comes out. Made this and it is delicious. I want to make it again. You can see tiny tofu pieces throughout. Is that ttypical? I am new to using tofu. Should I use an electric mixer to try and smoothe it out? Also. Can you freeze it?